Hey ya’ll, I’m 2-year-old Ryder and at only 82 lbs, yes, I would love to have dinner with you! And lunch. And breakfast. Snacks would be great, too! I bet you figured out my story, huh? 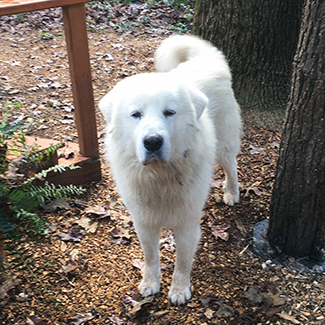 That I used to be a shelter dog, GPRA saved me, and now the vet says I need to gain 12-15 lbs on my way to being a full-size Great Pyrenees? Yep, you are right. GPRA’s vet is so nice, I definitely want to follow her directions. 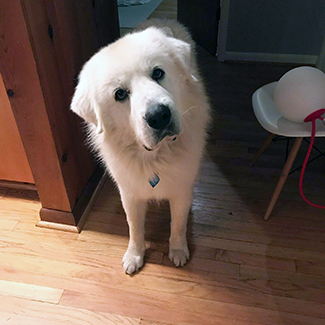 I’m also ready to practice following all those other directions humans give like “sit”, “stay”, and “hug.” I am still learning what type of dog I really am and counting on a GPRA foster to help me “find myself” so I can also find my best furever family. 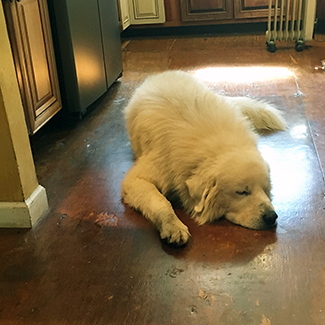 If you want to help me on my journey of self-discovery, and feed me!—email info@greatpyratlanta.com or click the “Apply to Adopt” button below.